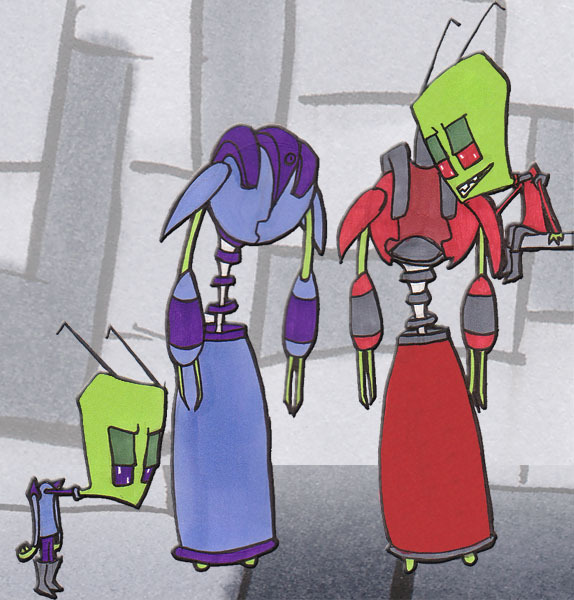 Tallest Blue, the Invader Zim fan character of mine, happens to be the Godmother of Zekk and Sergie’s spawning, Pan. And Blue spoils the child rotten. Pan likes Cherry Ice Sukkies. Um, yeah. After watching the invader Zim episode, “TAK: the Hideous New Girl” I felt the urge to draw this. She’s a brick . . .
House. Except she’s on the side of one. Hooray for graffiti, etc. I was bored today, so I took out a ball point and drew this pretty lady from scratch. I want her pants. 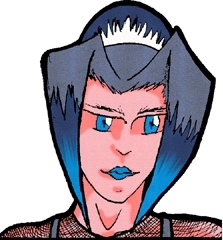 Also not that the character in the image is Kerin-schroe. Silly kitty. Schroe’s got a few souls inside her that like to take over her body and alter he appearence. Scissors is the soul of a gun-freak male warrior who would do anything for a satisfying kill. After reading a bunch of JTHM by Jhonen Vasquez, I decided to draw my character in his style. And here you have it – not quite Nny, but yay all the same. After noticing that the bodies of the Almighty Tallest keep getting thinner, it made me think, “What if there’s nothing there at all?” In the picture, you can see our Almighty “Tallest” next to their tall suits, Purple on the left, Red on the right. They aren’t tall at all, they’ve just got big heads, like Dib.